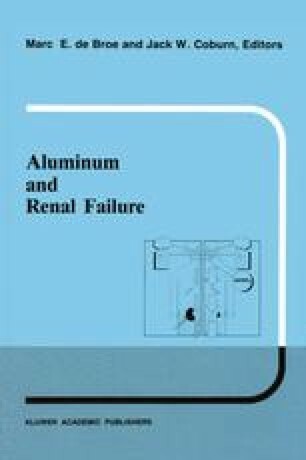 Ultrastructural techniques such as energy dispersive X-ray micro-analysis have been used to determine the localization and concentration of aluminum and other elements within sections of tissue from dialysis patients suffering from the effects of aluminum toxicity. By means of this technique aluminum has been shown to be present in high concentration within lysosomes of cerebral neurons of patients with dialysis encephalopathy and along the calcification front in bone from patients with vitamin D-resistant osteomalacia. These observations permitted a functional interpretation of the previous findings of high aluminum concentrations in bulk samples of brain and bone from such patients and helped to direct research efforts to attempt to determine the possible modes of toxic action of aluminum. The sites of localization of aluminum in these tissues have subsequently been confirmed by means of analytical ion microscopy, laser microprobe mass analysis and histochemical staining but, despite extensive study, the precise mode of toxic action of aluminum in chronic renal failure remains unclear.